The Cairo Institute for Human Rights Studies (CIHRS) issued a statement Wednesday criticising a new anti-terrorism bill and urging the president not to ratify it, describing it as "unconstitutional." The anti-terrorism bill defines "terrorist entities" and lays down penalties against any group identified as such by a criminal court. It was approved by the cabinet last week, a second-to-last step before becoming law. The bill is currently with President Abdel-Fattah El-Sisi, who has legislative authorities in the absence of an elected parliament, to either ratify it or send it back to the cabinet for further revision. The CIHRS statement urged El-Sisi to wait until the election of a parliament, due before the end of March 2015, to "discuss the bill and thoroughly revise it." The statement added that CIHRS considers the bill in violation of the 2014 Constitution, passed in January, the rulings of the High Constitutional Court, and "Egypt's international commitment to its ratified treaties." The statement inferred that the government is using the "fight against terrorism" as justification to pass laws that forgo key rights and freedoms. The statement lists a number of reasons for rejecting the new bill. First, that the bill has a loose definition of terrorist entities, which according to the statement is "unsuitable to the seriousness of the charge and the consequences of enlisting an organisation or individuals as terrorists." The bill gives the executive the right to dissolve any groups listed as terrorist entities and freeze their assets and money and arrest their members. The second reason for rejecting the bill, according to CIHRS, is that it stipulates that any entity can be labeled terrorist if they call "through any means" to stop a specific law or overturn a court verdict. The CIHRS criticised the wording "through any means", saying it could encompass peaceful calls by human rights organisations and political parties to abrogate a certain law, such as the controversial protest law. The third CIHRS criticism of the bill is that the terrorist label can be given to any organisation without proof that the organisation did any of the terrorist acts stipulated in the bill. The institute said that according to the law, prosecutors can accuse an organisation of being terrorist and a court can rule to enlist that organisation as terrorist, and that punishments stipulated by the law will be applied. Then a maximum of three years will be allowed to either confirm that the organisation is terrorist or prove otherwise and clear its name. According to Article 1 of the bill, a terrorist entity is any group that disrupts public order or threatens the safety, security or interests of society, or harms or frightens individuals or threatens their lives, freedoms, rights or security, or harms national unity. According to the bill, a terrorist entity is also any group that harms the environment and natural resources, or communications, or transportation, or public and private buildings, money or property, or occupies them or takes control of them, or hinders the work of public and judicial authorities, or places of worship, or hospitals, or educational institutions, or diplomatic and consular missions, or regional and international organisations in Egypt, or disrupts the constitution and the law with force or threats, or intimidation, to realise the group’s goals. 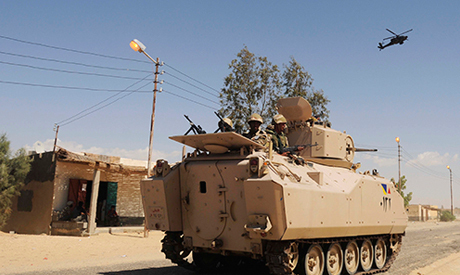 The military has been combating a decade-long jihadist insurgency in Sinai, with attacks increasing over the past year. Hundreds of soldiers and police have been killed, while the army says it has killed and arrested hundreds of jihadists. Civilians have also been caught in the violence.